The reality star spoke out after rumors started swirling that she was "Kiki" in the rapper's "In My Feelings" song. 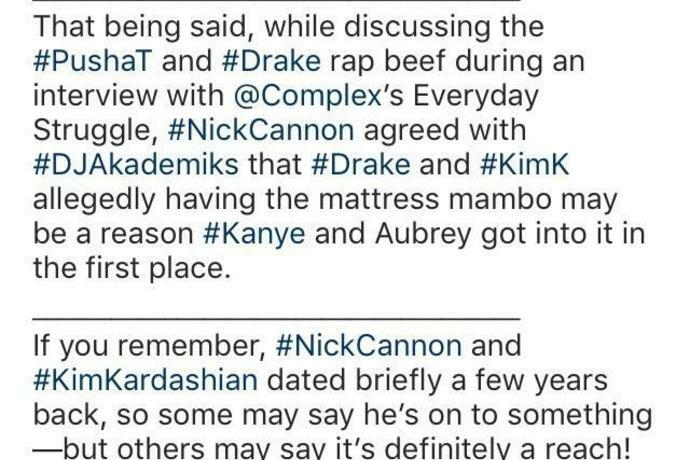 Cannon -- who dated Kim back in 2006 -- agreed that there might be something to the rumors, saying, "As a fan, stepping back, there's something real personal Drake holds over that whole family, that he's like, 'Ya'll don't want me to let this out.'" Meanwhile, Drake and Kanye are still at odds. On Thursday, Kanye spoke on Chicago's 107.5 WGCI Morning Show, calling Drake "insensitive" for continuing the feud during the time that the 41-year-old rapper was taking a break in Wyoming after receiving massive backlash thanks to his infamous comments that slavery was a choice on TMZ Live. "When we talk about the Drake thing, it hits me in a really sensitive place, because you hang around people and they come to your house and be around your family and this and that," he said. "And they get mad about a beat and send you purple demon emojis."